The first week of April has come and gone. There were a plethora of strong Canadian performances in college baseball as the calendar turned. Check it out below. It seemed like no one could tame Nick Seginowich (Victoria, BC) of Angelo State last week. He started his tear in Game 1 of a four-game series with Cameron by lacing two hits, one of which was a solo home run, and three RBIs in the 18-1 win. Seginowich hit a two-run home run and was hit by a pitch in a 26-8 Game 2 win. Game 3 was even better as he hit a three-run and two-run home run in a 6-1 win. He closed it all out with, you guessed it, another home run. This time it was a grand slam. He collected two hits in the 11-4 win, helping his team to the sweep. For his play he was named Lone Star Conference Hitter of the Week. On the season he is hitting .398 with 13 home runs, 47 RBIs, a .457 on-base percentage, an .813 slugging percentage and a 1.270 on-base plus slugging percentage. The Rams are now ranked at No. 3 in the NCAA polls. Ben Abram (Georgetown, Ont.) allowed one run over seven innings in the University of Oklahoma’s 4-2, 11 inning loss to Oral Roberts. Abram gave up three hits, walked one and struck out nine. The freshman is 5-0 with a 2.47 ERA. He has walked just five hitters over 40 innings of work in his rookie campaign. Jake Sanford (Dartmouth, NS) has been unbelievable for the Western Kentucky Hilltoppers this season. He got his week started with two hits and a RBI in a 5-4, 10-inning loss to NCAA Division I No. 5 Vanderbilt. In a three-game series with Middle Tennessee he collected seven hits, a walk and three RBIs. In Game 2 he hit a two-run home run. Unfortunately for him and his team they were swept by MTSU. Righty David Gauthier (Mont Sainte-Hiliare, Que.) punched out 15 hitters over seven innings of work in Nyack’s 15-5 Game 3 win over Bloomfield. Gauthier gave up five hits, two runs (one earned) and walked four. He has struck out 61 in 54 innings pitched. Tanner Dalton (Lethrbidge, Alta.) was summoned from the Sacramento State bullpen in all four games of the week. His first appearance came in a 6-2 loss to Nevada when he allowed an unearned run in an inning. Dalton didn't allow a hit but walked two. In Game 1 of their series with California State University Bakersfield he picked up the win by going two innings, allowing two hits and a run. He struck out one to improve to 2-1. Dalton struck out one in an inning of work to collect his third save in a 10-7 Game 2 win. In the finale, a 5-4 win, Dalton allowed a hit, walked one and struck out two in a scoreless inning to earn the win. It’s been a season like few others so far for Billy Brand (Burlington, Ont.). Brand worked 2 1/3 innings, gave up two hits and struck out three in Point University’s 5-3 loss to Reinhardt. He allowed two unearned runs in the game, the key being unearned. Through 17 appearances and 22 innings, Brand has yet to allow an earned run. His 10 saves lead all of the National Association of Intercollegiate Athletics. The Eagles of Embry Riddle Aeronautical University made a statement last week by sweeping a three-game set from the NCAA Division II No. 1 Tampa Spartans. After taking Game 1, 5-2 and Game 2, 4-3, the Eagles handed the ball to Garrett Goodall (Nanaimo, BC) to finish the job. Goodall delivered 6 1/3 innings, surrendering just one run to pick up the win in the 5-3 decision. He scattered six hits, walked one and struck out five. His record now stands at 6-0, while the Eagles are 22-11, 11-4 in Sunshine State Conference play. Embry Riddle has won nine of their last 10. Ben Marsh (Halifax, NS) tossed six scoreless innings to help SUNY Adirondack down Schenectady County Community College 5-1. Marsh allowed five hits, walked two and struck out eight. Josh Myers (Miscouche, PEI) played a big role in SUNY Adirondack’s 6-2 week. Myers had 10 hits, walked six times and had nine RBIs. He homered in a 4-3 Game 3 loss to Fulton Montgomery Community College. Corey Jackson (Calgary, Alta.) was ready when called for the University of North Carolina Greensboro Spartans. His first action came in an 11-3 win over High Point, a game that he picked up the win in. He threw 3 1/3 scoreless innings. He allowed three hits and struck out three. His next appearance was in a 10-3 Game 1 loss to Furman, Jackson gave up a run over 3 1/3 innings of work. He gave up a pair of hits and struck out five in the loss. Jakob MacLeod (Toronto, Ont.) struck out nine of the 15 outs he recorded for Genesee Community College in a 13-1 Game 3 win over Corning. MacLeod threw a complete game, five innings, surrendering three hits and the one run. He walked four Corning hitters. MacLeod also showed off his offensive abilities in the four-game set with Corning. In Game 1 he went 3-for-4 with a double, triple and home run, finishing a single short of the cycle. He also walked once and drove in four. Game 2 saw him go 2-for-3 with a walk, two RBIs and a stolen base. Starting Game 3 didn't slow his impact at the plate as he went 2-for-4 with a RBI and a stolen base. He wrapped it all up with a hit, a walk, two RBIs and another stolen base in the finale. Genesee earned the sweep with four convincing wins. No one scored until the 10th innings in Game 1 of Colby’s series with Barton. Unfortunately for Logan Hofmann (Muenster, Sask.) and the Trojans it was Barton who scored the only run of the game. Hofmann last into the 10th, throwing 9 2/3 innings and gave up just the one run in the 1-0 loss. Hofmann gave up seven hits, walked one and struck out six. Andrew Asselin (Winnipeg, Man.) got the start in Game 4 against Barton and went five innings, allowing two hits, two runs (one earned) and a walk. He struck out a pair in the 3-2 win, helping Colby to a 3-1 series win. Owen Harms (Winnipeg, Man.) backed his pitchers with six hits on the week. Harms went 4-for-5 with two home runs, three RBIs and four runs scored in a 12-10 win over McCook. Gavin Logan (Oyen, Alta.) contributed 11 hits for Southeastern Community College in seven games. Logan hit a home run in a 14-8 win over Ellsworth and finished his week with nine RBIs. He hit another home run and drove in four in a 19-9 win over Marshalltown. Logan walked three times, as well. Justin Snow (Mount Hope, Ont.) has been incredible in 2019. He continued his strong season by throwing six scoreless innings in Southeastern’s 11-0 thumping of Ellsworth. He allowed five hits, a walk and struck out five to improve to 4-0. In his next start Snow lasted 4 2/3 innings, giving up seven hits and 10 runs (two earned). He walked two and struck out five in a 10-0 Game 3 loss to Iowa Central Community College. Snow owns a 1.35 ERA and is striking out 11.03 per nine innings. Two Canadians were driving forces for the Lakeland College offence last week. Kyle Espineli (Scarborough, Ont.) and Max Van Gommingen (Brampton, Ont.) were put to work in an eight game week. Espineli collected six hits, walked once and drove in five, while Van Gommingen had seven hits, walked four times and had four RBIs. His best game was in a 27-17 Game 3 win over Clarke State when he went 3-for-3 with three walks, four RBIs and four runs scored. There wasn't much down time for Sam Poliquin (Montreal, Que.) in the LSU Alexandria bullpen this past week. He threw a scoreless 1/3 of an inning to earn his sixth save in a 10-7 win over the University of Mobile. He struck out the only out he needed. In the rematch, a 3-2 loss to Mobile, Poliquin gave up a run over 1 1/2 innings of work. He allowed three hits, walked one and struck out two. Poliquin picked up his second save of the week and seventh of the season in a 4-3 Game 2 victory over Texas A&M Texarkana. He allowed two hits in two scoreless innings and struck out two. Olivier Maillioux (Ville de Quebec, Que.) spun six scoreless innings for Northwestern Ohio in a 6-1 win over Lourdes. Mailloux surrendered three hits, walked two and punched out eight. His second time out was also impressive as he lasted eight innings and gave up one in a 5-1 win over Concordia. Mailloux allowed seven hits, walked one and struck out five to pick up the win. 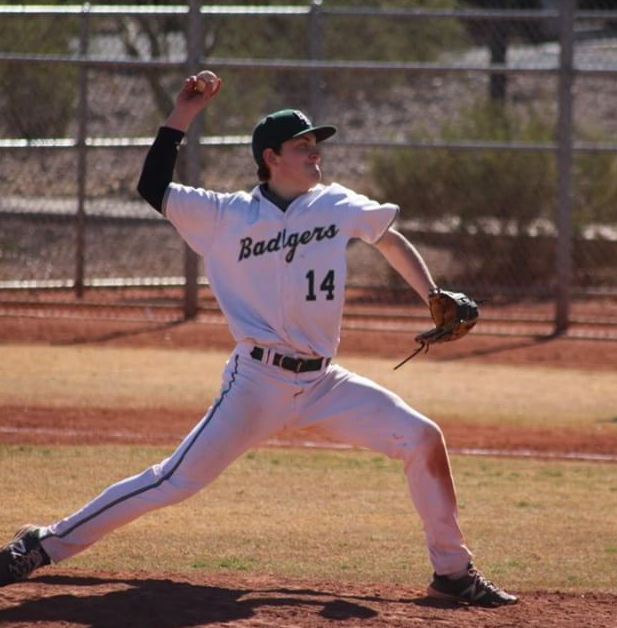 Badlands Badgers alum Tanner Huber (Unity, Sask.) tossed six scoreless innings for Bismarck State. The Presentation College JV’s struggled to get anything going against Bismarck State’s Tanner Huber (Unity, Sask.) over six scoreless innings. Huber gave up two hits and walked four during the outing. He struck out five in the win. The Mystics are 17-4 on the campaign. Noah Skirrow (Stoney Creek, Ont.) allowed four hits and walked four in five innings of work as the Liberty Flames dropped Game 2 of their series with the Lions of North Alabama. He allowed four runs (one earned) and struck out eight. An 11-1 win for Indiana Tech over Indiana University at South Bend was never really in doubt from the start. Part of the reason was the five scoreless innings Martin Eckard (Victoria, BC) supplied. Eckard allowed five hits and struck out four. John Lantigua (Quebec City, Que.) had a nice week for Oklahoma Wesleyan. He went 7-for-16 with a pair of walks and three RBIs. A scoreless inning of relief in a 7-5 Saint Francis win over Bethel was just the beginning for Matt Fiorini (Schombergon, Ont.) last week. Fiorini somehow gave up three hits and walked one but didn't allow a run. Fiorini then went five innings and gave up one run in a 7-3 win over Indiana Wesleyan. He surrendered four hits, walked four and struck out two to pick up the win. Toronto Mets alum Jake Foden (Toronto, Ont.) had five hits for St. Bonaventure this past week. It was a 1-4 week for St. Bonaventure. Jake Foden (Toronto, Ont.) had five hits, including a pair of multi-hit games for the Bonnies. Kyran Weemaels (Airdrie, Alta.) won his third game of the season by going the distance for Cobrini in a 4-2 win over Neumann University. Over the nine innings he gave up seven hits, the two runs and a walk. He struck out six in the impressive outing. It was a seven-hit week for McCoy Pearce (Kamloops, BC) of McPherson. Pearce walked twice and drove in three in six games. McPherson won five of those six games. Zackary Koroneos (Toronto, Ont.) hit a solo home run in a two-hit game for Penn State Harrisburg in a 9-6 Game 1 win over Southern Virginia. Koroneos had two hits in the game and drove in two. He then went 4-for-5 with another solo blast and five RBIs in an 18-1 Game 2 win. In the finale, a 13-4 loss, Koroneos had a hit and earned a walk. Wright State’s Tyler Black (Toronto, Ont.) collected seven hits, walked three times, drove in six, was hit by a pitch and stole two bases. Black hit two home runs, a solo shot in a 15-4 win over Indiana and a two-run blast in a 9-1 Game 3 win over Northern Kentucky. Wright State went 3-2 on the week but dropped the series with Northern Kentucky. Jackson Hogg (Surrey, BC) went 5-for-10 for Dodge City this past week. He went 3-for-5 with two doubles and two RBIs in a 10-7 Game 4 loss to Seward County. Spencer Marcus (Chatham, Ont.) went 3-for-6 with a two-run home run in a 10-5 win over Lamar. The rest of the week Spencer had six hits, a walk and two RBIs but their team was swept in the four-game series. After not playing for Indian Hills in a 4-1 loss to Southwestern, Soren Graverson (Calgary, Alta.) made the rest of the week count. He hit a triple, walked twice and drove in a run in a 6-4 win over Southwestern. Next up was Des Moines Area and Graverson had another hit, a walk and a RBI in the 5-3 loss. In a 9-2 win over Marshalltown he hit a home run and a double to finish a triple short of the cycle. He went 3-for-3 with 3 RBIs in the win. He hit his second home run of the week, a solo shot, in a 5-2 loss to Marshalltown to round things out. Samuel Chaput (Montreal, Que.) of Crowder College hit a home run in a 12-0 win over Three Rivers. He hit another one in a 5-4 Game 4 win over North Central Missouri. On the week Chaput had nine hits, four walks and seven RBIs. He stole a base, as well. As the week went on Luke Horanski (Dugald, Man.) got better. Horanski had a hit and was hit by a pitch in Virginia Tech’s 13-1 win over VMI. They then took on Wake Forest for a three-game series and Horanski had a hit in Game 1, two hits in Game 2 and three hits in Game 3. His hit in the opener was a solo home run. He walked twice and drove in a run in Game 2 then walked and had 3 RBIs in Game 3. Justin Raspanti (Vaughan, Ont.) hit two solo home runs for Northern Oklahoma Enid in a 7-1 win over Pratt to start his week. He finished the game 3-for-3 with a walk and four runs scored. In a four-game set with Carl Albert College he had four more hits, three walks and three RBIs. He hit his third home run of the week in a 16-3 win in Game 3. Brady Cappe (Waterford, Ont.) spun a gem for Pikeville in Game 3 of their series with Campbellsville. Cappe threw nine shutout innings, allowing just five hits with three walks and three punch outs in the 6-0 win. Luke Lubinicki (Regina, Sask.) had six hits, walked six times, drove in three RBIs, recorded three stolen bases and was hit by a pitch. Johnson County is 32-4 in 2019 which included a 5-2 showing last week. Malik Williams (Toronto, Ont.) had 12 hits in the seven games, helped by three, three-hit games. Williams walked five times, drove in seven and stole two bases. Adam Plouffe (Toronto, Ont) went 2-for-4 with three RBIs in Mars Hill’s 12-7 win over King. In a 13-8 Game 1 loss to Lenoir Rhyne he went 3-for-5 with four RBIs. Plouffe followed it up with a 2-for-3 game with a two-run home run in a 16-4 Game 2 loss. Aiden Brook (Oakbank, Man.) had a six hit week for Valley City State. He also drove in two as his squad went 2-3. Leading off seems to suit Alex Bedard (Levis, Que.) just fine. Out of the leadoff spot last week he collected seven hits, walked four times, had a RBI and stole two bases. Bedard finished a home run from the cycle in an 8-3 Game 3 loss to Harding. On the year he is hitting .370 and is 21-for-25 in stolen base attempts. Archer Brookman (Point-Claire, Que.) can be a force in the middle of the Seminole State (OK) lineup. Last week he had five hits, walked twice, drove in three and swiped a pair of bases. The offence provided by Bryce O’Farrell (Burlington, Ont.) didn't translate into wins for the University of Pittsburgh. O’Farrell hit a three-run home run and was hit by a pitch in the Panthers 5-4 loss to West Virginia. Game 1 of their series with Duke, a 2-0 loss, saw O’Farrell get a hit. He had a hit, a walk and a RBI in a Game 2 loss. They couldn't avoid the sweep despite O’Farrell’s best efforts. O’Farrell hit a two-run home run in the top of the ninth to tie Game 3 at 9-9 but the Blue Devils would win it 10-9 in 10 innings. The Canadian had three hits, a walk and four RBIs in the game. Clayton Keyes (Calgary, Alta.) had seven hits for Central Arizona. Two of the hits were home runs, one against Yavapai in a 9-5 loss and one against Western Arizona in a 7-6 win. Keyes walked once and drove in three in the four game week. Cole Warken (Regina, Sask.) helped Erskine to a 3-1 week with six hits, a walk and three RBIs. The only loss was in the final game of the week. It was a 12-RBI week for Daniel Lichty (Denfield, Ont.). Lichty also walked three times and hit a two-run home run on the week for the Huntington Forresters. He had a stolen base to go along with his 10-for-21 performance. Grant Okawa (Mississauga, Ont.) and Drake Pilat (Winnipeg, Man.) were crucial components in the engine of the Jamestown Jimmies offence. Okawa had nine hits, including a home run in a 12-1 win over Mount Marty. He had three RBIs, a stolen base and was hit by a pitch. Pilat meanwhile had nine hits, five walks and seven RBIs. He had four, two-hit games in the process. Eric Marriott (Niagara Falls, Ont.) had eight hits and four stolen bases for Mitchell. Eight hits, a walk, three RBIs and four stolen bases is what Eric Marriott (Niagara Falls, Ont.) provided for Mitchell last week. Mitchell went 4-1 in their slate of games. Eric Thrower (Toronto, Ont.) went 4-for-4, finishing a home run shy of the cycle, in Georgetown College’s Game 2 win over Cumberland. He drove in three in the win. In the series he had seven hits, a walk, four RBIs and three stolen bases. Evan Webb (Whitby, Ont.) played well in a busy week for Concord. Webb collected nine hits, six walks and 12 RBIs in six games. He went 3-for-4 with six RBIs, a stolen base and was hit by a pitch in a 14-3 win over Salem. Webb also hit a two-run home run in both Games 3 and 4 of their series with West Virginia State. Concord won both of those games. The week got off to a good start for the University of Illinois at Chicago as they downed Northwestern 4-2 after getting 5 1/3 strong innings from Braden Toikka (Vancouver, BC). Toikka gave up two hits, two runs (one earned) and struck out four. Unfortunately for the Flames they dropped 2-of-3 to Youngstown State later in the week. Ohio Valley went hitless both times they saw Davis and Elkin’s Kade Kozak (West Kelowna, BC) in their four-game series. The first time was in a Davis and Elkin 3-2 Game 1 win. Kodak tossed four scoreless innings and struck out four. In Game 3 the freshman threw an inning, gave up an unearned run, walked two and struck out two. Parker Walker (Minesing, Ont.) tossed a complete game for Bryant and Stratton in their 9-1 win over Olive-Harvey College. Walker scattered seven hits and struck out five. The only run he gave up was unearned. He also went 4-for-8 at the dish in three games. Spencer Davis (Regina, Sask,) threw four scoreless innings for Monterey Peninsula in their 9-6 Game 1 win over Gavilan. Davis allowed two hits and two walks, while striking out five in the win. He was back in action in Game 3 working a scoreless inning. Davis gave up a hit and struck out one in a 19-6 win. His team may have dropped 3-of-4 but Carson Burns (Orangeville, Ont.) of Western Texas had a good series against Midland. Burns had nine hits, walked four times and drove in three in the series. Dante Frederico (Burlington, Ont.) helped lead Labette to four wins with five hits, a walk and four RBIs. He went 3-for-3 with two RBIs in a 15-2 win over the Baker JV’s. It was a stellar start for George Farid (Mississauga, Ont.) as he went 3-for-4 with two RBIs and a stolen base for East Central Community College in a 5-4 win over Jones College. In the second game with Jones he went 2-for-3 with two more RBIs. He then had a hit in a 4-0 win over Northeast Mississippi Community College. East Central downed Northeast Mississippi 9-2 to close things out. Keith Manby (White Rock, BC) went 3-for-4 with a home run and seven RBIs for Miles Community College in an 18-2 Game 1 win over Dakota College at Bottineau. During the week that included five games he finished with six hits total, three walks and 10 RBIs. Toronto Mets alum Liam Hicks (Toronto, Ont. )had two multi-hit games for Mineral Area College. After dropping the first three games of their series, Mineral Area salvaged a win against St. Louis in Game 4. Liam Hicks (Toronto, Ont.) had two hits, two walks and two RBIs in the series finale victory. In Game 1 he had a hit. Two hits, a walk and a stolen base was contributed by Hicks in a Game 2 loss. Game 3 ended in a 6-5 loss but Hicks did have two hits a RBI and a stolen base. Parker Savard (Sudbury, Ont.) collected six hits for Dakota County Tech in their 2-1 week. In the opener, a 8-4 loss to North Iowa Area he had two hits, a RBI and a stolen base. Savard then went 3-for-3 in an 11-1 win over Itasca Community College. He had a hit, drove in two and swiped a pair of bases in the rematch, a 13-3 win. Earlier in the season the University of British Columbia Thunderbirds took three of four from Lewis Clark State. Well, Lewis Clark State evened things up last week by taking three of four from the Thunderbirds. James Bradwell (Gibsons, BC) got into a pair of games on the mound. The first came in a 4-3 Game 1 loss when he threw 2/3 of an inning and gave up an unearned run. That run was scored in the bottom of the ninth resulting in a walk off win for the Warriors. He allowed a pair of hits, walked one and struck out one. Bradwell was back on the mound in Game 4 working six scoreless innings in the only win of the series for UBC. He allowed two hits and struck out five in the 6-5, 11 inning Game 4 win. Nolan Weger (Surrey, BC) helped supply the offence in the series. Weger had six hits, walked twice and drove in two. He launched a solo home run in the Game 4 win. Reed Ohland (Vauxhall, Alta.) went 3-for-5 with a RBI in Allen Hancock’s 10-8 loss to Santa Barbara. Ohland had a hit and walked as Allen Hancock lost to Santa Barbara again the next game, 6-5. Ohland and his squad picked up a win over Oxnard 11-2 to snap a six game losing skid. Ohland had a hit and a walk in the win. Nolan Rattai (Medicine Hat, Alta.) of Columbia College played in five games last week and had seven hits. He hit a two-run home run and scored four runs in a 12-11 win over Harris-Stowe State. When the dust settled he finished the week with three walks, four RBIs and was hit by two pitches. The only loss of the week for Xavier came in a matchup with Eastern Kentucky. Matt Warkentin (Leamington, Ont.) went 2-for-4 with a solo home run in the 5-3 loss. Xavier then swept Georgetown behind six hits, a walk and two RBIs from Warkentin. Team Manitoba alum Jared McCorrister (Boissevain, Man.) had eight hits in Mayville State’s four-game sweep of Dakota State University. Jared McCorrister (Boissevain, Man.) kickstarted his week by going 3-for-4 with a home run and three RBIs for Mayville State in their Game 1 win over Dakota State University. He finished a triple short of the cycle in the 7-2 win. In Game 2 he had a hit, a walk, a RBI, was hit by a pitch and stole three bases in a 6-0 win. The third game of the series ended in a 10-0 win for Mayville State and McCorrister had two hits, one being a home run and a RBI. He also legged out a triple in the win. They completed the sweep with an 18-5 win with McCorrister collecting two hits, a walk and a RBI. Jean-Francois Garon (Terrebonne, Que.) had eight hits, three walks, four RBIs, was hit by a pitch and stole three bases in five games for Bradley. Bradley went 5-0 in those games. Muskegon’s Jon Henry (Toronto, Ont.) had four hits and drove in five last week. He also walked once and stole a base. Jake Wilson (New Lowell, Ont.) chipped in six hits for Bowling Green State in four games. He drove in one as his team went 2-2. In both Games 1 and 2 of Point Park’s series with Brescia Jake Forgrave (Toronto, Ont.) had hits. In Game 1, a 4-0 win he went 2-for-4. In Game 2, a 17-2 win, he went 2-for-3 with a RBI. Point Park won Game 3 by a 10-1 score. Gianfranco Morello (Toronto, Ont.) was all over opposition pitching for Charleston. He had nine hits, two walks, three RBIs and two stolen bases in a 6-0 week. What a week it was. Standout performances from Canadians littered boxscores across college baseball. Check this column out next week to read about more highlights.